While celebrated all over India, it is most elaborate in Maharashtra, Goa, Gujarat,Orissa , Karnataka, Tamil Nadu and Andhra Pradesh. Outside India, it is celebrated widely in Nepal and by Tamil Hindus in Sri Lanka. Before 1893, Ganesh Chaturthi used to be an important family festival during the Peshwa rule in Maharashtra, but that year, Indian freedom fighter and social reformer Lokmanya Tilak transformed the annual festival into a large, well-organized public event. Tilak recognized the wide appeal of the deity Ganesh as "the god for everybody�, and popularized Ganesh Chaturthi as a national festival in order "to bridge the gap between Brahmins and non-Brahmins and find a context in which to build a new grassroots unity between them", and generate nationalistic fervor among people in Maharashtra against the British colonial rule. Tilak encouraged installation of large public images of Ganesh in pavilions, and also established the practice of submerging in rivers, sea, or other pools of water all public images of the deity on the tenth day after Ganesh Chaturthi. Under Tilak s encouragement, the festival facilitated community participation and involvement in the form of intellectual discourses, poetry recitals, performances of plays, musical concerts, and folk dances. It served as a meeting ground for people of all castes and communities in times when, in order to exercise control over the population, the British discouraged social and political gatherings.Mumbai s godfather Vardhabhai (Varadharajan Mudaliar) recently popularized Ganesh Festival in the recent known times. The festival is observed in the Hindu calendar month of Bhaadrapada, starting on the shukla chaturthi (fourth day of the waxing moon period). The date usually falls between 20 August and 15 September. 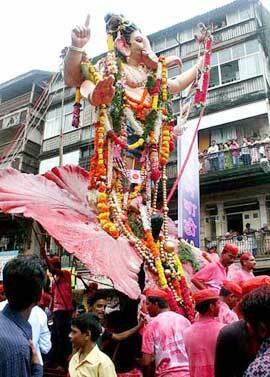 The festival lasts for 10 days, ending on Anant Chaturdashi. This festival is observed in the lunar month of bhadrapada shukla paksha chathurthi madhyahana vyapini purvaviddha. If Chaturthi prevails on both days, the first day should be observed. Even if chaturthi prevails for the complete duration of madhyahana on the second day, if it prevails on the previous days madhyahana period even for one ghatika (24 minutes), the previous day should be observed. Two to three months prior to Ganesh Chaturthi, artistic clay models of Lord Ganesha are made for sale by specially skilled artisans. They are beautifully decorated & depict Lord Ganesh in various poses. The size of these statues may vary from 3/4th of an inch to over 25 feet. Ganesh Chaturthi starts with the installation of these Ganesh statues in colorfully decorated homes and specially erected temporary structures mandapas (pandals) in every locality. The pandals are erected by the people or a specific society or locality or group by collecting monetary contributions. The mandapas are decorated specially for the festival, either by using decorative items like flower garlands, lights, etc. or are theme based decorations, which depict religious themes or current events. The priest, usually clad in red silk dhoti and shawl, then symbolically invokes life into the statue by chanting mantras. This ritual is the Pranapratishhtha. After this the ritual called as Shhodashopachara (16 ways of paying tribute) follows. Coconut, jaggery, 21 modakas, 21 durva (trefoil) blades of grass and red flowers are offered. The statue is anointed with red unguent, typically made of Kumkum & Sandalwood paste . Throughout the ceremony, Vedic hymns from the Rig Veda, the Ganapati Atharva Shirsha Upanishad, and the Ganesha stotra from the Narada Purana are chanted. For 10 days, from Bhadrapad Shudh Chaturthi to the Ananta Chaturdashi, Ganesha is worshipped. On the 11th day, the statue is taken through the streets in a procession accompanied with dancing, singing, and fanfare to be immersed in a river or the sea symbolizing a ritual see-off of the Lord in his journey towards his abode in Kailash while taking away with him the misfortunes of his devotees, this is the ritual known as Ganesh Visarjan. At individual homes the Visarjan is also done on 3rd, 5th or 7th day as per the family tradition. All join in this final procession shouting "Ganapathi Bappa Morya, Pudhachya Varshi Laukar ya" (O lord Ganesha, come again speedily next year). After the final offering of coconuts, flowers and camphor is made, people carry the idols to the river to immerse it. The main sweet dish during the festival is the modak (modagam or modakam in South India). A modak is a dumpling made from rice flour/wheat flour with a stuffing of fresh or dry-grated coconut, jaggery, dry fruits and some other condiments. It is either steam-cooked or fried. Another popular sweet dish is the karanji (karjikaiin Kannada) which is similar to the modak in composition and taste but has a semicircular shape. Public celebrations of the festival are hugely popular, with local communities (mandalas) vying with each other to put up the biggest statue & the best pandal. The festival is also the time for cultural activities like singing and theater performances, orchestra and community activities like free medical checkup, blood donation camps, charity for the poor, etc. Today, the Ganesh Festival is not only a popular festival, it has become a very critical and important economic activity for Maharashtra. Many artists, industries, and businesses survive on this mega-event. Ganesh Festival also provides a stage for budding artists to present their art to the public. The same holds true for Hyderabad and Chennai too. Ganesh Chaturthi is celebrated in the UK by the migrant Hindu population as well as the large number of Indians residing there. The Hindu culture and Heritage Society, UK - a Southall based organisation celebrated Ganesh Chaturthi for the first time in London in 2005 at The Vishwa Hindu Temple. The Idol was immersed in the river Thames at Putney Pier. The festival is similarly celebrated in many locations across the world. The Hindu Swayamsevak Sangh USA, an organisation of Hindus based in the US organises many such events to mark the various Hindu festivals. In Canada, Ganesh Chaturthi is celebrated by various associations of Marathi speaking people. (MBM in Toronto, MSBC in Vancouver etc.). Celebration of Ganesh Chaturthi in Mauritius dates back to 1896. The first Ganesh Chaturthi Puja was held in the 7 Cascades Valley next to Henrietta village by the Bhiwajee family who is still celebrating this pious festival for more than a century. Over the years the festival gained such popularity on the island that Mauritian government has attributed a public holiday for that day. The most serious impact of the Ganesh festival on the natural environment is due to the immersion of icons made of Plaster of Paris into lakes, rivers and the sea. Traditionally, the Ganesh icon was sculpted out of earth taken from nearby ones home. After worshipping the divinity in this earth icon, it was returned back to the Earth by immersing it in a nearby water body. This cycle represented the cycle of creation and dissolution in Nature. However, as the production of Ganesh icons on a commercial basis grew, the earthen or natural clay (shaadu maati in Marathi) was replaced by Plaster of Paris. Plaster is a man made material, easier to mould, lighter and less expensive than clay. However, plaster takes much longer to dissolve and in the process of dissolution releases toxic elements into the water body. The chemical paints used to adorn these plaster icons themselves contain heavy metals like mercury and cadmium. On the final day of the Ganesh festival thousands of plaster icons are immersed into water bodies by devotees. These increase the level of acidity in the water and the content of heavy metals. The day after the immersion, shoals of dead fish can be seen floating on the surface of the water body as a result of this sudden increase.